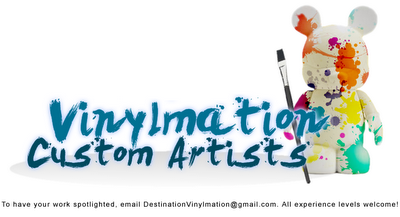 Destination Vinylmation: What is your background in art? Karen Turner: I have always been interested in art. As a child I took classes in drawing, painting with watercolors, and painting with acrylics. I was in art in high school and majored in art in college for a while. I then changed my major to history, but art still remained important to me. 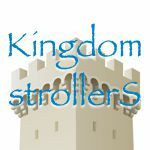 After working as an office manager for several years I came back to art and opened an online shop selling my work. In the end I just kept coming back to my love for creating and painting. DV: What other non vinyl things have you done? KT: Lots!! I paint ceramics, create trinket and treasure boxes, make jewelry, create decorative pieces for the holidays (not just Christmas, but Easter, Valentine’s, Halloween…) As you can see in my shop – custom Vinylmation make up one section, but there are lots of other sections as well – I like doing lots of different things – nothing ever gets dull or flat that way – everything remains fun and challenging for me!! DV: What’s your favorite Disney designed vinyl? KT: Just one? That’s too hard!! My favorites that I have are: It’s a Small World 3″ from Park 3, Squares from Urban 4, Mardi Gras, and Love 9″ from Urban 6. My favorites from the ones I don’t own (yet) are Magical Stars from Park 1, It’s a Small World 9″ from Park 1, Teacups from Park 1, Birds on a Wire, Red Scream, Railroad from Park 9, Skyway from Park 9, Living with the Land from, and the Gumball Ear hat set. I’m not really good at narrowing things down!! DV: What inspired this Bedazzled line of customs? KT: In November I was at the Magic Kingdom for my birthday (and to check out the new Fantasyland), and was looking at the different figurines in the glass shop on Main Street that are jeweled with crystals and I thought I Vinylmation covered with crystals would be really awesome, so I decided to give it a try. DV: What was the most difficult part of making these? KT: I used the new mold for these, which made it a lot easier because of the smoothness of the surface – no buttons of noses to work around. For the Miss Mouse figurines I used Minnie’s Fly Girls from the Park Series #11, which gave me the bow on her head. The hardest part was just getting the crystals to fit in everywhere – not having any open spots that were too small for a crystal but too big to leave blank. I quickly realized that I had to work quickly so if I needed to move some crystals I could before the glue dried. Working quickly doesn’t mean these were quick to make though. These were the most time consuming customs I have made yet, but I am super pleased with how they turned out – I think I am going to have to make one for myself, since these are for my shop!! DV: What do you think about the upcoming Minnie platform? KT: I can’t wait for it!! When I saw it Mickey’s Circus I was so excited – all sorts of ideas were going through my head on what I could do with that mold. I have all sorts of things planned to do with those as soon as I can get my hands on them. Having a Minnie mold just furthers the idea of what Vinylmation started out as to me – whatever design I put on a Vinylmation, it comes back to the fact that I am putting it on Mickey Mouse – Mickey (and soon Minnie) are at the heart of it all – which is like what Walt Disney said – “It all started with a mouse.” That mouse is still at the heart of all things Disney, and I try to keep that idea in mind when creating my custom Vinylmation. DV: Where can people find out more about your and your artwork? I have lots of new ideas I am working on for custom Vinylmation – right now my work table has five Vinylmation that are in various stages of creation. I have a 9″ Custom in mind that I think is really going to be spectacular – as soon as I finish it I will share it with you. So, there will be lots of new things coming in the next few months – and I am super excited about it all! !